With the major holidays creeping up on us sooner rather than later, it’s crucial for those wanting to look their best to have effective yet simple beauty treatments ready to go. In the end, who doesn’t want to be at their best when the onslaught of holiday parties, nights out, and New Year’s occasions is in full swing? When caring for your face, forget about overpriced face masks—you have all the ingredients you need for face masks right in your kitchen for as little as one tenth the original price. When they’re applied topically, the many so-called superfoods you hear about could provide the skin with the nourishment it needs to have that perfect, healthy glow this winter. 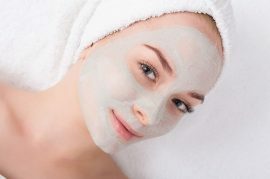 With that in mind, check out these homemade face masks, where all you need to do is mix, apply, and let the mask sit for half an hour before rising with warm water. If you have particularly dry skin, mix a ¼ cup of oatmeal and a 1/3 cup of hot water (not boiling), and let it sit for about three minutes before adding one tablespoon of Manuka honey, two tablespoons of coconut oil, and a tablespoon of sugarless, plain yoghurt. This mask works well in large part because of the benefits its key ingredients offer, such as Manuka honey, which is said to be full of antioxidants for helping to fight aging skin and wrinkles while also drawing moisture into your skin and giving it a soft feel. On the other hand, coconut oil has amino acids, vitamin E, and caprylic and lauric acid, which forms part of your skin’s barrier function and helps maintain its natural flora. For dull skin, you need to mash half of an avocado together with two tablespoons of Manuka honey, two tablespoons of sea salt flakes, and a tablespoon of apple cider vinegar. The sea salt flakes work well as natural exfoliators for removing dead skin whereas the apple cider vinegar should help in tightening and brightening your complexion. If you have a lot of redness or regular breakouts, try mixing a ¼ cup of sugar-free plain yogurt together with a teaspoon of raw Manuka honey before adding a teaspoon of activated charcoal powder and three quick drops of tea tree oil. Regarding activated charcoal, it’s said to draw micro-particles and bacteria to your skin’s surface, allowing you to cleanse your skin more deeply. For tea tree oil, it’s alleged to have anti-inflammatory properties, so any skin infections or redness can benefit greatly from only a couple of drops. Need to order some Manuka honey so you can make a Manuka honey face mask? To get your order started, click here. And, remember, we offer FREE shipping on all orders of $150 or more.